I’m not what you would call an “avid” golfer, but my husband is and so are many, many people here in Hawaii. And, who can blame them? We have nearly perfect golf weather year-round and are home to some of the best golf courses in the world. 1. Ko Olina: Even though this course is rated as “extremely challenging,” Ko Olina was consistently mentioned as a great place for women golfers. Recently, some of the best female golfers in the world played there during the LPGA Lotte Championship. While other golf courses have tough greens and unfavorable tradewinds, this course is primed to perfection for your golfing experience, and that maans many female golfers can navigate the course just fine. Also, the amenities include locker rooms with jacuzzis, saunas, and showers. Golf in the morning/afternoon and stay at [haw]Ko Olina for the Paradise Cove Luau, which is located on the adjacent property. Contact Hawaii Aloha Travel for the best rates. 2. 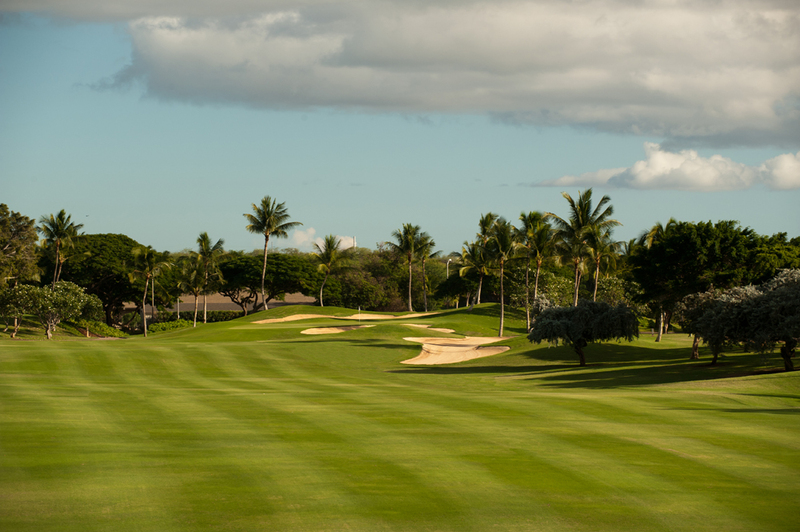 Royal Kunia: The course was re-opened in 2003 and has been a local favorite ever since. The course is blessed with great views of Pearl Harbor and the city of Honolulu and is situated only 35 minutes from Waikiki. For women who are just beginning to learn how to golf, this may be the course to try, since it offers a great golfing experience for the beginner to low handicapper. Recently, some of the best female golfers in the world played at Ko Olina during the LPGA Lotte Championship. 3. Coral Creek: For female golfers who are just starting out, Coral Creek is a great choice because of the affordability factor ($140 before noon and $80 after noon). So, as you’re learning how to play, you won’t go broke! For more experienced female golfers, the course (located in Ewa Beach), offers 6,808 yards of challenging par 72 golf, that is playable and enjoyable to any handicap skill level. Short par-4s playing into the prevailing trade winds are the course’s trademark. 4. Hawaii Prince: One of the great things about playing at Hawaii Prince in Waikiki is the interchangeable nine holes, which makes it easy to tailor it to your skill set. For many female golfers who like to “change things up,” this is definitely a selling point! 5. Ewa Beach Golf Club: Ewa Beach Golf Club is another affordable option for female golfers who are just starting out ($115-$160 on weekdays) and don’t want to a big financial committment up-front. Located at the far end of the Ewa plains, the course is also ideal for female golfers who don’t want to feel rushed or crowded-out by the speedier groups. And, you may be surprised how scenic this course is: With the Waianae mountain range in the background, you get a unique experience from the very first shot as you tee off over the remains of a kulanakauhale, or ancient Hawaiian fishing village. You will also be visited throughout your round by native species of birds including the alaekeokeo, aukuu, and the endangered aeo. One of the great things about playing at Hawaii Prince in Waikiki is the interchangeable nine holes. 6. Ala Wai Golf Course: One of the many reasons I included this golf course in my list of the top Oahu golf courses for women is because it’s relatively small and compact — and convenient for locals. For ladies who are still improving their strokes, this course is great because it’s only a par-70 course. But, book early — although it’s possible to secure a tee time, it’s not easy. Stand-by or mid to late afternoon is a visitor’s best bet. 7. Fazio Course at Turtle Bay: Female golfers love this course at Turtle Bay because it’s known as more forgiving than the Palmer Course. It also has a walker-friendly layout and is also known as a great primer for the Palmer experience. Over the years, the Fazio has been utilized for the LPGA Tour’s Hawaiian Open, as well as the Inaugural Champions Tour Skins game which featured many professional golfers. 8. Palmer Course at Turtle Bay: When you’re ready to graduate to the Palmer Course at Turtle Bay, you should certainly give it a whirl. Known as the more demanding of the two Turtle Bay courses, the Palmer Course features 18 holes as it meanders its way through the natural wetlands of the North Shore. For women golfers looking to up their game, this is the course for you! Now, who’s ready to tee up! ?